Welcome to our Mullica Hill Rotary Club! Mullica Hill Rotary hosted the Relay for Life Survivor Tent at Clearview Regional High School on, Friday, June 8. The weather was great and this year was even a bigger turnout than in the past. Our membership had an awesome evening meeting, greeting and serving survivors and their extended families a diverse healthy meal from our local Harrison House Dinner. Having an opportunity to meet these folks who have survived cancer was a great experience. Our Mullica Hill Team is always jumping in to make a difference in our community and on June 8, 2018, "we made a difference" as a Team. Have you ever asked yourself What is the Rotary?? 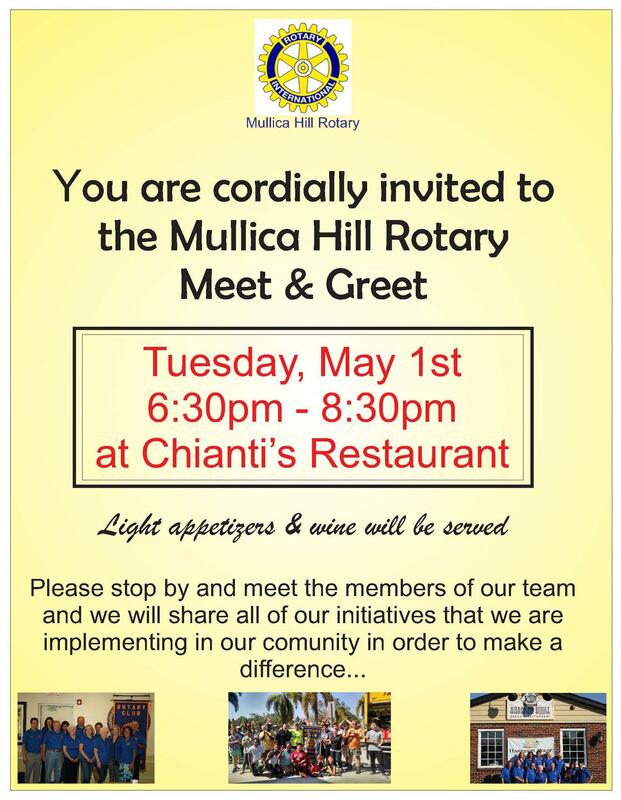 Well, now you have a chance to find out about the Mullica Hill Rotary!! Come join us for a fun night and meet the club members. Appetizers and Beverages will be served. The Comedy Night was a huge success for our Club. We had a packed house at the American Legion in Mullica Hill. Each Comedian had the crowd laughing, not to mention the funny antics of "The Coach"!!!! Our basket Raffle proved to be a success as well. Wanted to Thank Laurie Iannucci for her dedication in getting all of the donations and for organizing the basket raffle. Lotsa fun had by all...... until next year!!!!! Rotary assists Trinity United Methodist Church at their Pancake Breakfast venue on the Church grounds. Denise Racano assumes the Mullica Hill Rotary leadership role with lots of expectations and desire to increase membership and make a difference in the community. Stephen Houpt leads our Mullica Hill Rotary Dictionary giveaway program to the local school districts. Rotary members Kathy Balog and Mark Gravinese battle the weather to repaint the Rotary People Mover at the 4-H Fairgrounds in preparation for the annual 4-H Fair. On Friday, June 9th members of the Mullica Hill Rotary volunteered and hosted the Survivor's Dinner. The weather was perfect and the engagement with the survivors was very memorable. The dinner included a variety of specialty sandwich's and salads crafted by the Harrison House Diner. The treat of the night was homemade brownies cooked and prepared by longtime Rotary member, Judy Baillere. It surely put smiles on a lot of faces. The entire Rotary Team was involved in feeding all family members and sharing the stories with each of the survivors and their family members. On June 9th, Mullica Hill Rotary made a difference in our community! All members of the Rotary of Mullica Hill are dedicated volunteers who strive to make a difference in the community. Our team is diverse and looking to have new members join us... We meet weekly on Wednesday mornings at the Harrison House Diner at 7:30am. Please stop by and introduce yourself, and lets have a discussion on how you too, can be a Rotary Team member! On a beautiful evening in Mullica Hill at the Clearview Regional High School, the Rotary of Mullica Hill sponsored and hosted the "Survivor's Tent and Dinner". Members of the Rotary engaged the large crowd of survivors and shared memorable moments. What a night to remember!